Manila, Philippines - In the wake of the 8.2 magnitude earthquake in northern Chile, Senator Loren Legarda today reminded Filipinos to prepare for strong quakes, stressing that even a 7.2 magnitude earthquake in the Philippines could already result in massive devastation. 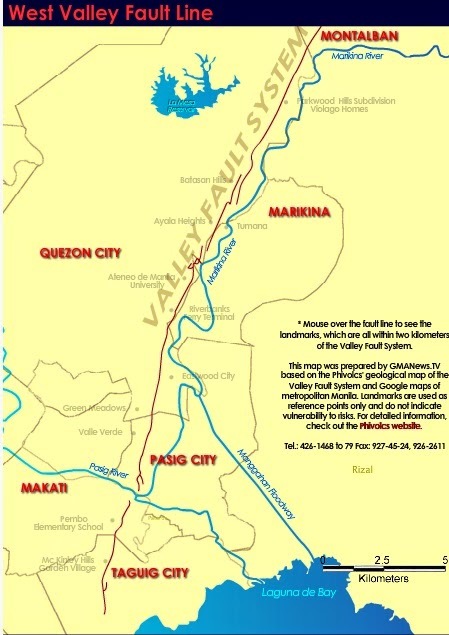 "According to the Philippine Institute of Volcanology and Seismology (Phivolcs), the Marikina Valley Fault Line is ripe for movement but no one can predict the exact time when it will move. This makes preparedness for such eventuality even more important," said Legarda, the UN Champion for Disaster Risk Reduction and Climate Change Adaptation for Asia-Pacific. In 2011, Phivolcs deputy director Bartolome Bautista explained that the earthquake fault, which runs from the Sierra Madre mountain range to Tagaytay, moves every 200 to 400 years. A Metro Manila Earthquake Impact Reduction Study revealed that 7 out of 17 cities in Metro Manila will suffer the most damage and casualties if a massive earthquake occurs at the West Valley fault. The 7 cities are Marikina, Quezon, Pasig, Makati, Pateros, Taguig and Muntinlupa. Earlier, Legarda stressed the need to conduct monthly safety drills in schools and hospitals, which are critical infrastructures since these are shelters for the vulnerable--children, the sick and elderly. "We want to institutionalize monthly safety drills in all educational and healthcare facilities. But this should not be limited to schools and hospitals. Government institutions, private companies, local government units and even households should conduct regular emergency drills because these activities will help instill disaster preparedness in our citizens. Being prepared means that when a natural hazard such as an earthquake strikes, every citizen would know what to do and where to go, and that government agencies, both national and local, are ready to respond," she said. The Senator added that aside from preparedness, another important goal is disaster prevention, which ensures zero or low casualty and less damage to properties. "As part of our disaster preparedness and prevention strategies, we should regularly evaluate and retrofit buildings and critical structures, set up early warning systems and identify safe refuge for our citizens. We will not tire of demanding from concerned government agencies the establishment of necessary mechanisms to secure our communities from the devastating effects of disasters such as earthquakes. We will also continue to urge communities to take the initiative in making sure that they are well prepared and will not be caught off guard when natural hazards strike," Legarda concluded.